March 17, 2019 at 1:01 pm. He’s back and in a big way! 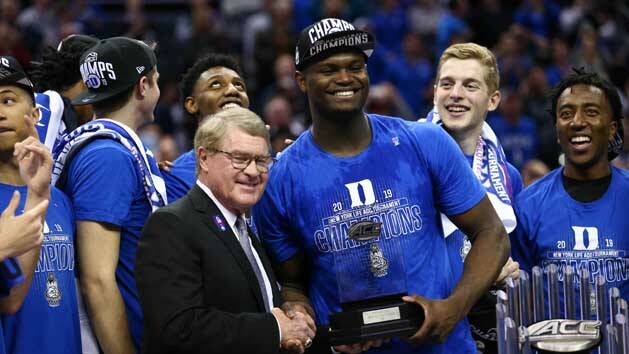 After missing three weeks with an injury, freshman sensation Zion Williamson returned with a dominating three-game performance at the Atlantic Coast Conference Tournament and led Duke to the title in a 73-63 win over Florida State in the championship game. Williamson had 21 points; Trey Jones scored a career high 18 points and had 6 assists and 6 steals; RJ Barrett 17 points and 9 rebounds, and Cam Reddish added 11 points giving Duke its 21st tournament title. Coach Mike Krzyzewski his record 15th ACC Tournament championship. The game was tied at 36 all at the half but Duke was able to pull away in the final five minutes for the victory. Mfiondu Kabengele scored 14 points, and Terance Mann added 12 points for the Seminoles. FSU upset No. 2 Virginia in the semifinals to reach the championship game. Williamson was named the tournament’s most valuable player. He scored 29 points on 13-for-13 shooting and had 14 rebounds in his first game back against Syracuse. Then came an even bigger performance in the semifinals: 31 points, 11 rebounds and the final-minute tip-in that ultimately helped Duke hold off third-ranked North Carolina, 74-73, in a rivalry classic. Everett Case Award (tournament MVP) winner Zion Williamson of Duke shot 33-of-43 from the floor in three 2019 ACC Tournament games. The freshman forward’s .767 field goal percentage set a new tournament record (minimum of 25 attempts), breaking the previous mark of .759 (22-for-29) set by former Duke All-American Mike Gminski in 1980. His 81 total points in this year’s tournament broke the previous Duke three-game ACC Tournament scoring record of 80 points set by Art Heyman in 1961. Williamson also set an ACC Tournament three-game freshman scoring record, topping the 78 points scored by North Carolina’s Phil Ford in 1975.